Mark S. Waskow is an art collector on a grand scale. He owns many thousands of artworks, most of them by Vermont artists. 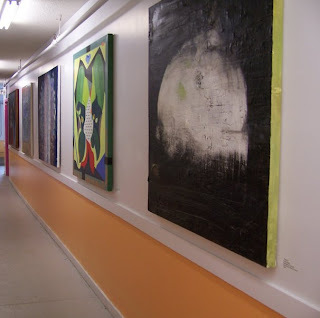 These works are housed at two residences and four other spaces that are exclusively devoted to storing and displaying the collection, which is known (at all its various locations) as the Waskowmium. He would like to create a non-profit public institution to permanently house this treasure trove, but while he's working on that project, he keeps on needing to find space for the collection in its present form. He recently moved some of his collection to a new location in Burlington when development pressure drove the rent in two of his spaces too high. I spent a few hours this morning photographing the space for a catalog he is creating, and, while I was at it, took a few shots to share with readers of Vermont Art Zine. 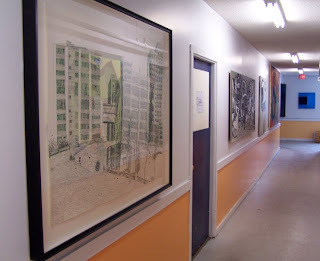 In the hallway outside his space, Mark has hung large paintings, drawings, and mixed media work. 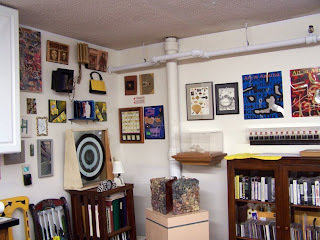 Inside the new space are artist books, works on paper, 3-dimensional work (primarily, but not exclusively, by Vermont artists), material related to the Vermont arts scene, and other art memorabilia. 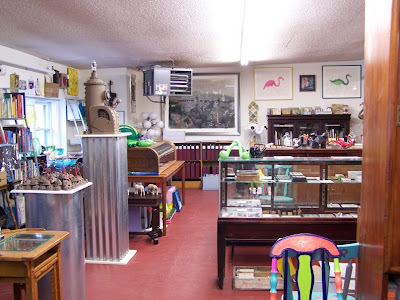 This place is chock-a-block with vitrines, cases, sculptures, publications, videos, artist-decorated chairs and flamingos. It's really overwhelming to see this much art -- and to realize that it's only a drop in the bucket of what's out there stored in artists' studios. 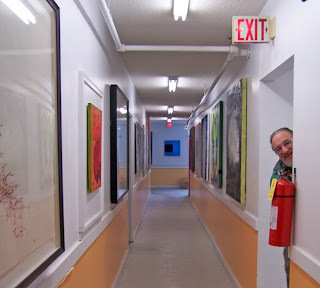 In addition to art, Mark collects all kinds of paper having to do with art and artists in Vermont – catalogs, invitation postcards, posters, and artist portfolios. He has between 1,000 and 1,200 artist books, almost 3,000 zines, and at least 5,000 art books. This is a tremendous resource and a wonderful archive that will preserve the history of the visual arts in Vermont. And here's Mark himself. With all the energy this man has, it's going to take more than a small fire extinguisher to put out his fire. OPINION: What makes art vandalism happen? OPINION: Is there a Vermont style or styles? 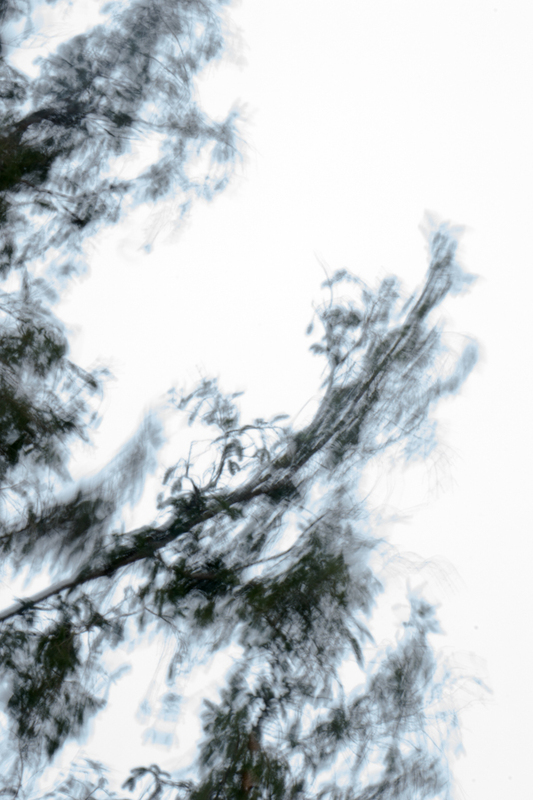 REVIEW: Galen McDonald "National Reservation." REPRINT: Hugh Townley "Against the Grain"